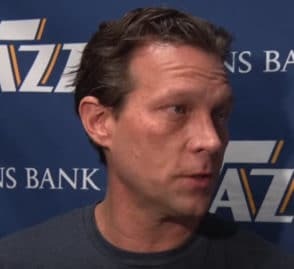 What can you learn from the Quin Snyder Defense Notes? The Quin Snyder Defense Notes will show you a glimpse of why you should be watching the Utah Jazz. The Jazz is for real, and every NBA fan should be watching them. The Knicks has their dysfunction, the Warriors are rolling, and the Celtics are a rumor mill, but the Jazz is the most compelling basketball team in the NBA. They have had injuries, doubts, and struggles in crunch time, but they are now making the promise of what might be a playoff bound roster. The Jazz is worthy of your attention, but they demand it. Utah could be a 50-55 win club even without showing what they can do. No team lines up against the Golden State Warriors, but the Jazz has the type of right players to give it a go against them. The Jazz has solid interior defense and length on the perimeter which is their calling card. They could give the top notch teams in the Western Conference all that they bargain for in the playoffs. They share a three-way tie for the best defense in the league. The Quin Snyder Defense notes will show you how they are defending the pick and roll defense. The Utah Jazz grind and string out possessions and rack up fouls so they can pressure you. Their defense makes any Jazz lead feel like it’s double. The Utah Jazz is a like a vise grip. The Utah Jazz is like a puzzle that the best players in the league and they fluster the top teams that play them. No one is allowed to play their game. They smother slower inside teams with Golbert and Derrick Favors. Faster units are brought to a stop and made to execute without numbers in the fast break. Every one of the NBA’s rapid pace teams is slowed down by the Jazz and denied seven or eight possessions from their average. Quin Snyder does a great job with the Utah Jazz. They use their balance in the offense to set up misdirection all over the floor, using screens in opposite directions to throw the defense into a blender. Most people will give coaching accolades to Gregg Popovich, Steve Kerr, Brad Stevens or Rick Carlisle. Coach Synder knows his way on the basketball court.